The technology sector is one of the fastest growing industries globally, but experiencing skills gap! Especially there is low involvement of Girls in the ICT field. Before, the number of girls and women involved in the ICT field was low, but since then the circumstances have changed. Different initiatives have empowered and inspired these women to become involved in the field of ICT. One of these initiatives is the “Girls in ICT” conference. This year’s Girls in ICT conference served as a reminder that every girl and women have the power to change the statistics. 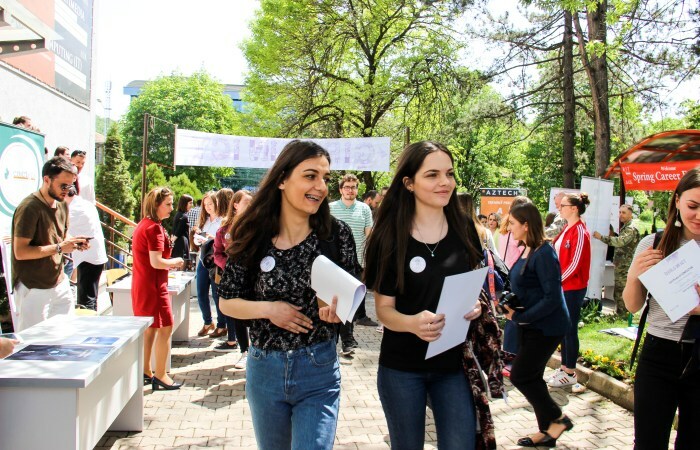 The Girls in ICT conference was held on Friday, the 27th of April, on the campus of RIT Kosovo and gathered hundreds of girls interested in the field of ICT, influential actors of the field, inspiring speakers, and companies of the field offering hiring opportunities to the girls. This year’s Girls in ICT conference organized by IPKO Foundation would not be possible if it was not for our partners: A.U.K Training and Development Institute, Girls Coding Kosova, and our supporters Ministry of Economic Development, Municipality of Prishtina, US Embassy, and USAID Empower Private Sector. The opening of the conference was done by Abetare Gojani – Program Director of IPKO Foundation and Visar Jasiqi- Chief Operation and Outreach Officer at RIT Kosovo, and we got the chance to hear some inspiring words from Valdrin LLuka, from the Ministry of Economic Development. After the inspiring talks, we had a small reception allowing the girls the opportunity to network with the speakers and the guests, and also attend the workshops. These workshops were held by Kalsoom Lakhani on Visioning/Storytelling & building your pitch, AUK-TDI organized two workshops on “Social media marketing” and “Graphic Design and Drones” and our talented girls from Girls Coding Kosova held two workshops: “Front end development” and “Wordpress”. These workshops allowed the girls to learn more about the ICT field through hand on learning. After the girls had just learned new skills and had been certified, they had the chance to attend the Job Fair where over 20+ companies/institutions were seeking for ambitious girls ready to join their team. Until next year, the next conference, and the next opportunities!